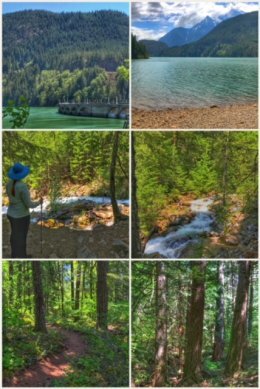 Stop 30: North Cascades National Park… and More! Oh, the fun we had on this stop of the trip, including two forays into the mountains of North Cascades National Park, #13 on our list of national parks explored on this adventure — and one of the least visited of all the national parks. This isolated park in northern Washington state is also surrounded by three national forests: Mt. Baker-Snoqualmie, Wenatchee, and Okanogan National Forests. North Cascades National Park is a vast wilderness of more than 500,000 acres, and is partially unaccessible for almost half the year as Highway 20 — the North Cascades Highway — closes for about 5-6 months each year. 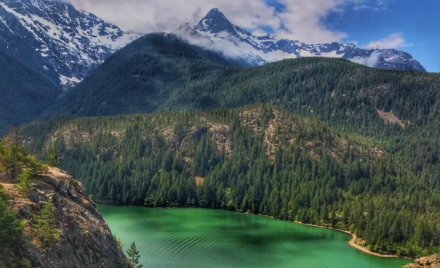 About 94 percent of North Cascades National Park is designated wilderness — and the park has more glaciers than Glacier National Park! Very few roads lead into the park, but multiple access points can be found along Highway 20. Probably one of the most popular places is just adjacent to the park: Ross Lake National Recreation Area. There are also three dams along the Skagit River: Gorge Dam (with a fun little trail), Ross Dam (which results in Ross Lake), and Diablo Dam (resulting in Diablo Lake). 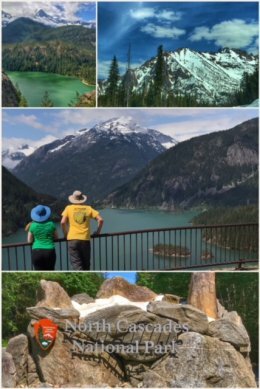 One of our favorite places is Diablo Lake (seen in the featured photo above, as well as in the pictures to to the left), which has the most amazing color — caused by glacial runoff pulverizing mountain rock, resulting in a sort of “rock flour” that sits on the surface of the water. 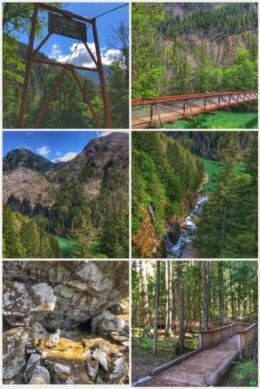 Besides viewing the lake from a wonderful overlook, we also took the dam road down to the 6.8-mile Diablo Lake Trail (which also intersects with several other trails). 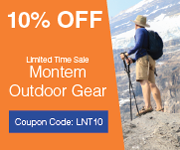 The trail takes you through multiple landscapes during a moderate hike, including rainforest-like lush areas, old creek gorges, and, eventually to a viewpoint from which to see the gorgeous green lake. The trailhead is near the North Cascades Environmental Learning Center, and you can find the access road just a few miles east of Newhalem, a cool little town that also has a few “hidden” trails. 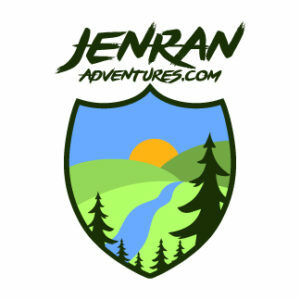 We had driven through Newhalem several times in the past, even using it as a good rest-stop area… never knowing it had two amazing trails right there! We first hiked the Trail of the Cedars, an easy 1-mile loop trail with interpretive signs about the trees, past fires, and more. The variety of trees is amazing, including firs, pines, cedars, maples, birch, and yews. You start the hike on a cool suspension bridge, crossing the Skagit River. 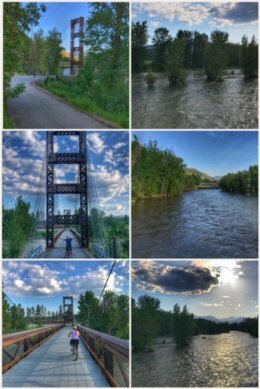 At the end of the first loop, the old (and now restored) Newhalem Powerhouse stands — and it was there we met a security guy who told us about another nearby trail: The Rock Shelter Trail. This paved and accessible trail leads to an ancient archaeological site (about 1,300 years old) along Newhalem Creek — an old hunting camp sheltered by a large boulder. You can still see soot marks on the rock from long-ago campfires. Next up was a visit to the third jewel of the area — Lake Chelan National Recreation Area, just south and east of North Cascades National Park. Lake Chelan is the largest natural lake in the state, but its elevation is now controlled by the Lake Chelan Dam. 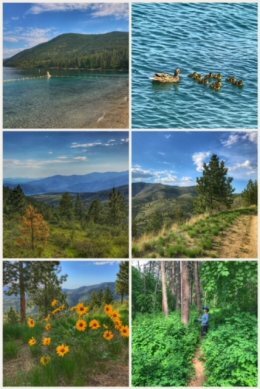 We visited the Lake Chelan State Park, a 127-acre camping park on the northwest end of the lake, enjoying a wonderful little hike on Little Bear Trail, a fairly easy 2.3-mile loop hike on the lower slopes of Bear Mountain. We had fun doing a little bush-whacking while reading fun and informative interpretive signs along the way; it is a great trail for children. We then circumnavigated the the lake and drove up to Echo Ridge, on the east side, which offers spectacular views of the lake and the surrounding mountains. The balsomroots were amazing up at the top! With the mountain snowmelt and runoff in full effect, we decided we next had to visit Falls Creek Falls — located just outside the cute western-themed town of Winthrop; local folks had told us the falls would be spectacular — and they were not kidding. The creek, one of several tributaries that led to the Methow River being wild and overflowing, was overflowing its banks — and the falls were crashing with a volume we had not witnessed before. The trail to the lower falls is fairly short — and paved. If you want to hike up to the top of the falls, it’s about a 2-mile hike up along a dirt trail with some switchbacks… but the vistas make it worth the effort! 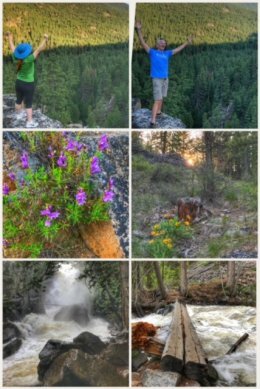 We had a slight scare during this hike when Jenny couldn’t find Ran, and thought perhaps we had been swept up into the raging creek while trying to take that perfect picture; long story short, we all survived to tell the story! This leg of the trip also fell during Ran’s birthday, so we decided to engage in multiple fun activities, starting first at Sun Mountain Lodge, a mountain-top lodge on about 3,000 acres, and including the 120-acre Patterson Lake. 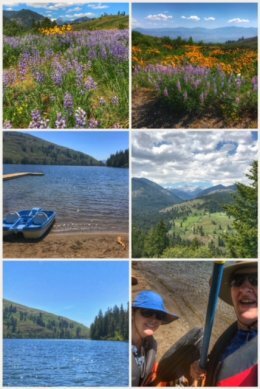 The weather was perfect, and the lupines and balsamroots amazing, as we headed to the lake to peddle-boat and kayak. It was the first time on the trip that we had a chance to get on a lake. After we finished at the lake, we headed up to the lodge (which also has a great restaurant), and enjoyed the views from the top. But peddle-boating, kayaking, and hiking were not enough for us to celebrate Ran’s birthday, so we also decided to take a 5-mile bike ride in and around Winthrop, partly on the Susie Stephens Trail and over the quite unique Spring Creek Bridge. We used Winthrop as the hub for this leg of the trip — and we truly had a blast. We met friendly people who offered multiple suggestions — including Falls Creek Falls. The town also offers many options for dining and lodging and camping — as well as shopping and biking. And the adventure opportunities that surround the town are endless! We hit 14,000 miles on our trip odometer on this leg of the trip — all since we started back in January! Next up we spend more time around the Columbia River and check out one of the coolest remnants of the great Missoula Flood: Dry Creek Falls.